1936 Ft. Worth Fat Stock Show & Rodeo Vintage Pin Up Gal! 1929 Ft. Worth Fat Stock Show & Rodeo Vintage Pin Up Gal! 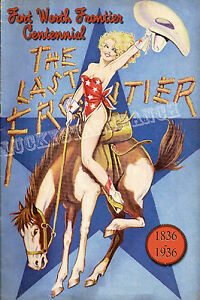 Details about 1936 Ft Worth TX Frontier Centennial Rodeo Pin Up Gal! 1936 Ft Worth TX Frontier Centennial Rodeo Pin Up Gal!